When I was growing up, on the weekends my mother would send me over to my grandparents' house. I lived for these weekends--my grandmother doted on me, and my grandfather went along with my grandmother in most things. Every Friday night, when I came over, we would go for a stroll around our neighborhood, walking along the cracked sidewalks and sweating in the Florida humidity and talking of lord only knows what. But I do know what. "Tell me about the olden days," I'd cajole them. And they would. 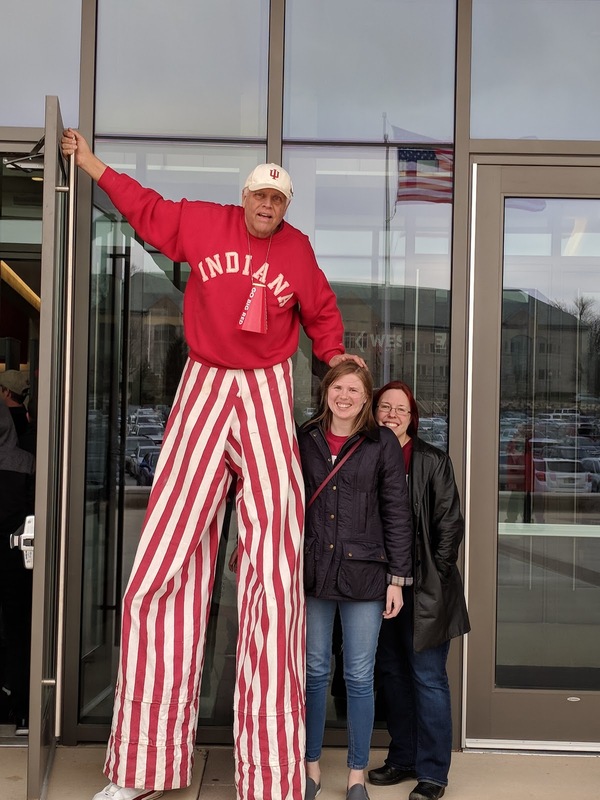 I remember my Boppa telling me a little about his high school years in 1930s Tipton, Indiana--now, this was a man who was Hoosier to his core. He was quiet, whip-smart, hardworking, and humble about it. So when he would talk about his years playing basketball in high school, there was never any bragging in his tone. It wasn't until after he passed away that I learned from his sister, my Great Aunt Wilma, that he was something of an MVP on his team. After high school, there wasn't much of a question of him having any sort of future in basketball--even if it weren't for the Great Depression, and then the war, my grandfather's people were tenant farmers, working hard to just keep body and soul together. But he was damned good at his basketball, and even into his last years, he loved watching the game. It wasn't just my grandfather, either. Basketball is kind of a major thing here in the Heartland--basketball and corn. We play one and eat the other. 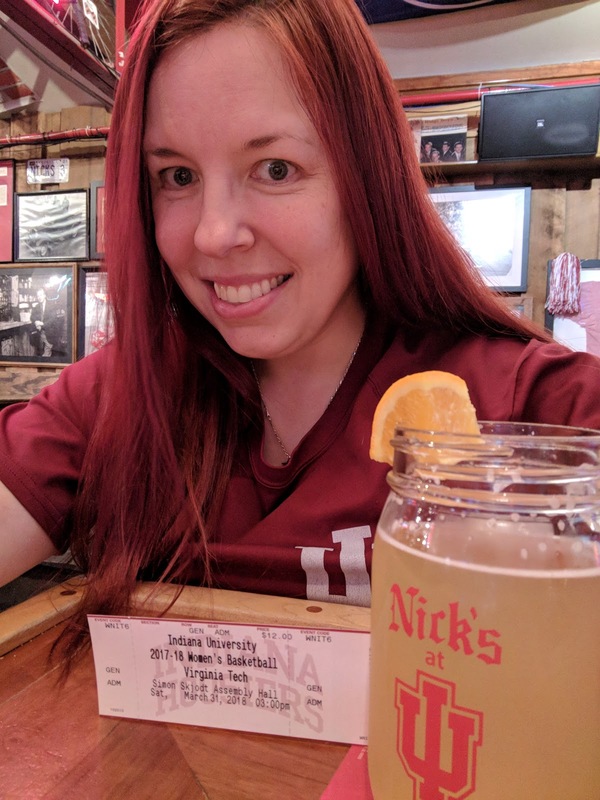 Now, I am not a sports girl at all--usually, I would bracket basketball in with all the other sportsball stuff. 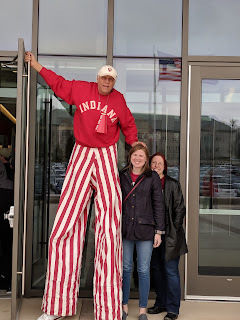 But I am a Hoosier girl, and I've been meaning to get to a game for while. My cubicle mate at work diligently, dare I day religiously, attends a lot of the women's basketball games. First, because yay! women! and second, because they are a lot cheaper than the men's basketball games. So I hear some updates from her, from time to time, on how "the team" is doing. And recently, I heard "the team" was doing pretty well. Like, championship well. Combine that with a friend from the big city in town for the weekend, a couple of rainy days, a slight panic attack of "Oh my god what can we do? 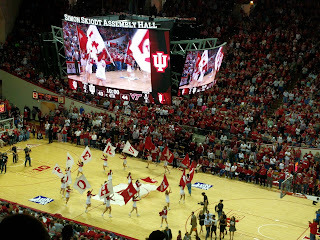 ", and some free tickets, and I (along with my city-slicker friend) got to enjoy THE HOOSIER NATION experience. Usually, the women's basketball games don't generate a huge attendance. 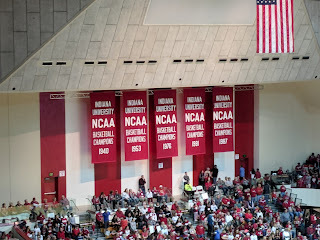 But because we hit the day that they were doing the WNIT Finals, and WE were in the finals, and it was at OUR stadium...we broke a record. 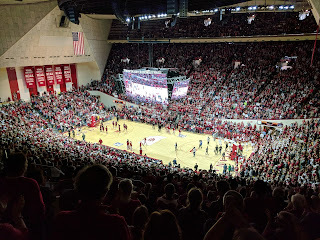 13,007 people showed up for this game. I know next to nothing about basketball. 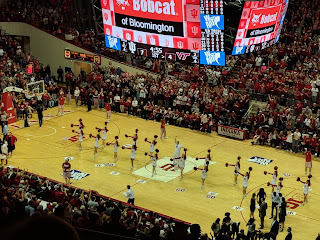 But I know it's fast-paced, I know basketball is a thing here, I know my grandfather loved it...and I figured this would be a fantastic Bloomington/Hoosier Experience for the both me and my friend. And it was! It was the largest crowd to attend a IU Women's Basketball game. 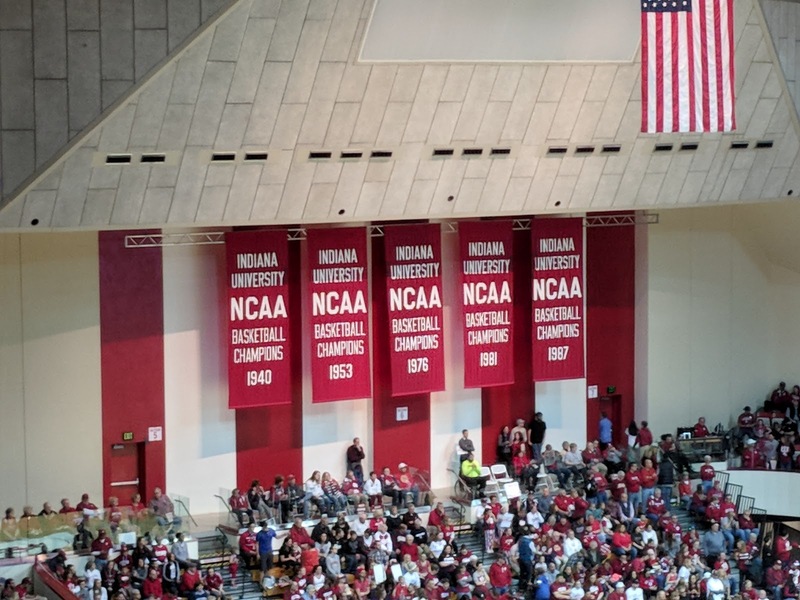 It was rather exciting to be part of IU History, even if it was a rather modest sort of legacy when compared with all the other records and victories. More importantly, with that many people, the crowd was lit! And, I quickly realized--a crowd really helps make the game. 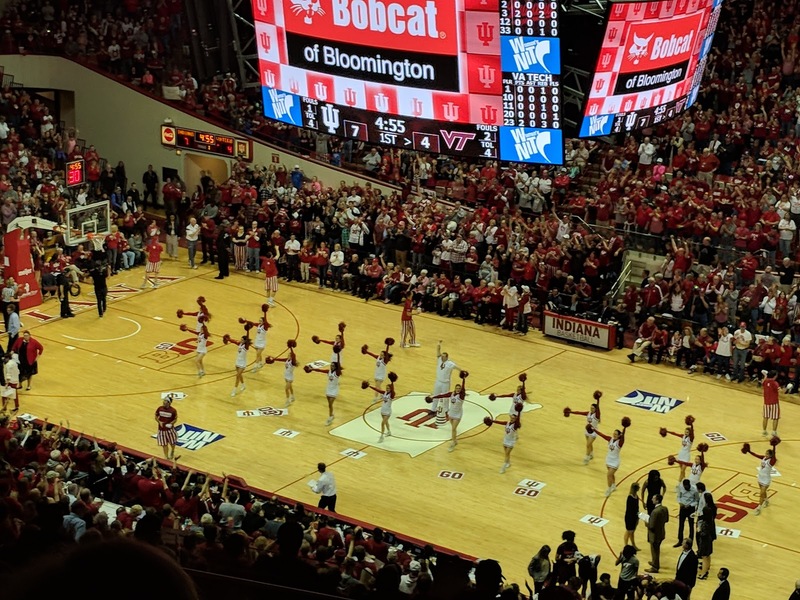 Bet the cheerleaders and band really appreciated having an engaged (and huge) audience for this event. I can, and am, as cynical about sportsball as the next person--the enormous amounts of money poured into athletics, the abuses of power, the scandals, as well as my vague suspicion that sportsball is as much of an opiate for the masses as religion or movies--all give me the feeling that this (along with probably every other facet of western consumer culture in which I am, to greater or lesser degrees, a willing participant) is...well, problematic, for lack of a better word. But I'm not one to denounce an activity or entertainment just because I have some issues with it, and nor am I a person to deny myself the enjoyment of that activity. Particularly since, as the game commenced, I was pleasantly bombarded with memories of a very patient grandfather attempting to explain the rules of basketball to his youngest granddaughter. I don't know that I believe in ghosts, but I do believe in being haunted (or accompanied by) powerful memories of the folks we love, and it felt like my Boppa's company was close by during that game. Also, we ("we", ha) won the game. 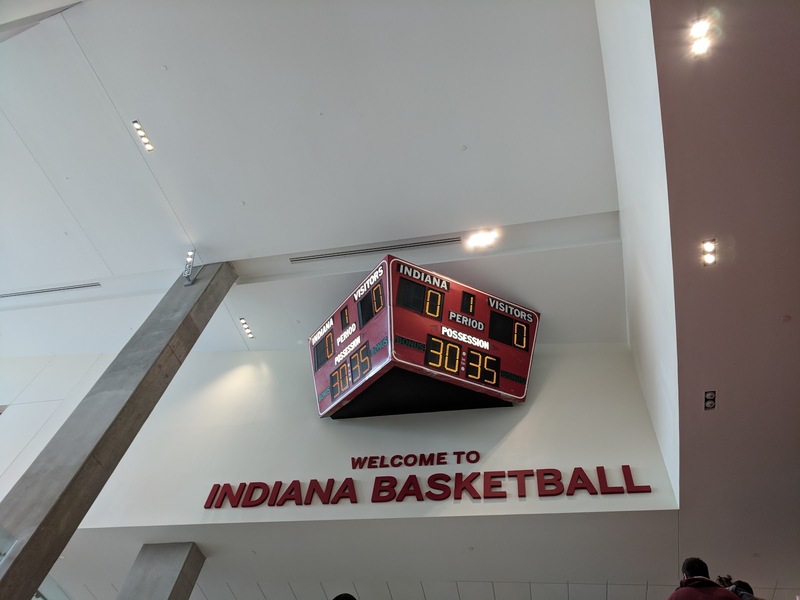 Icing on the Hoosier Cake. 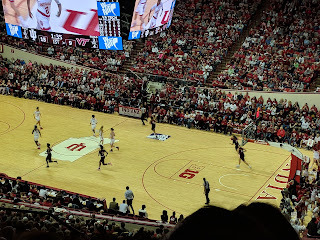 Will I get season tickets to the Women's games next year? Or even (gasp!) shell out for a ticket to some of the men's games? I don't want to say for certain...but I am very much tempted, if it means carrying on a bit of my grandfather's memory, as well as becoming more embedded in my adopted home.